Jerwin Ancajas (26-1-1, 17 KOs) will defend his IBF junior bantamweight title against his mandatory challenger Teiru Kinoshita of Japan. The title defense will be held on July 2 as part of the undercard for Manny Pacquiao vs. Jeff Horn IBF welterweight championship. The reliable source was matchmaker Sean Gibbons, who was connected with MP Promotions. 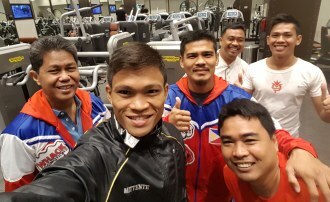 The 25-year-old Ancajas was fresh from a knockout win over Jose Alfredo Rodriguez of Mexico last January in Taguig this year following a unanimous decision win over McJoe Arroyo of Puerto Rico, from whom he won the IBF belt last September in Macau. The Panabo City fighter used his right jab as potent weapon in the first two rounds, and scored a knockdown in round 8 to win a unanimous decision over Arroyo with the scores of 118-109, 115-112 and 117-110. In the first defense, Rodriguez was declared unfit to continue after the seventh round as the ring doctor pronounced that Rodriguez’s shoulder was too injured to continue fighting. Kinoshita, 31, is currently ranked No. 3 contender by the IBF and is having a six-fight winning streak, with his last three wins by knockout. But his last two fights were won against fighters who made their professional debuts. Also he has not fought outside of his country in Japan. Kinoshita has lost only once, in 2014 against present WBO bantamweight titleholder Zolani Tete for the same IBF title he will be fighting against Ancajas. The former Japanese IBF junior bantamweight champion has fought only in 8-rounders against lesser opponents prior to the Tete fight. The only blemish in his pro career was inflicted by Mark Anthony Geraldo in 2012 in a ten-round majority decision loss. Ancajas grew up in a simple lifestyle in Panabo City, Davao del Norte. He is the youngest of three children, with his father working in the banana plantation while his mother took care of the family. He said he found his fortune when his older brother Jesar introduced him to boxing at age 9. “I began to like boxing. It's as if I could not live without boxing even though I was still so young,” Ancajas said as quoted by Rappler. He won two gold medals at the National Games, then another gold at the 2008 Palarong Pambansa as an amateur fighter. He was not able to join the national team for an international competition because he turned professional at the age of 17. He won his first 14 bouts before suffering his first defeat to Geraldo in Lapu-lapu City. The loss was controversial and his team had always thought Ancajas had won that fight. He considered it as a learning experience and had since won eleven straight fights all by knockouts. “Ever since my loss to Mark Geraldo, I put it in my mind to give it even more because my performance was still lacking. By God’s grace the good fights came one after the other,” said Ancajas. Ancajas joined MP Promotions of Senator Manny Pacquiao. He then became a world champion when he fought Arroyo and won the IBF diadem. Ancajas, Pacquiao and Donnie Nietes are the only remaining Filipino world boxing champions at present.